On February 1, 2019, officers of the FSB, the Russian state security apparatus descended from the KGB, arrested a dozen people in the latest wave of their campaign of repression against accused anarchists throughout the country. After brutally torturing them over the following 24 hours in order to force them to agree to incriminating statements, they released 11 of them. The twelfth arrestee, Azat Miftakhov, temporarily disappeared within the legal system while the FSB continued torturing him and refusing his lawyer access to him. This is just the latest in a series of events in which the FSB have systematically employed torture to force arrestees to sign false confessions in order to fabricate “terrorist conspiracies” involving activists. This pattern will continue until people put enough pressure on the Russian government to discourage it from disappearing and torturing young people—or else, if this does not occur, until the secret police serving other governments, emboldened by the successes of the FSB, escalate their own use of torture and fabricated “conspiracies” to suppress activism in other countries as well. Update: Azat Mivtahov has been found in the police station in Balashikha, Moscow region. The investigator claims he was arrested only at 19:10 pm on February, 2. Azat and his lawyer confirmed the use of torture. This entry was posted in Repression and tagged Russia on 2019/02/04 by Rote Hilfe Schweiz. 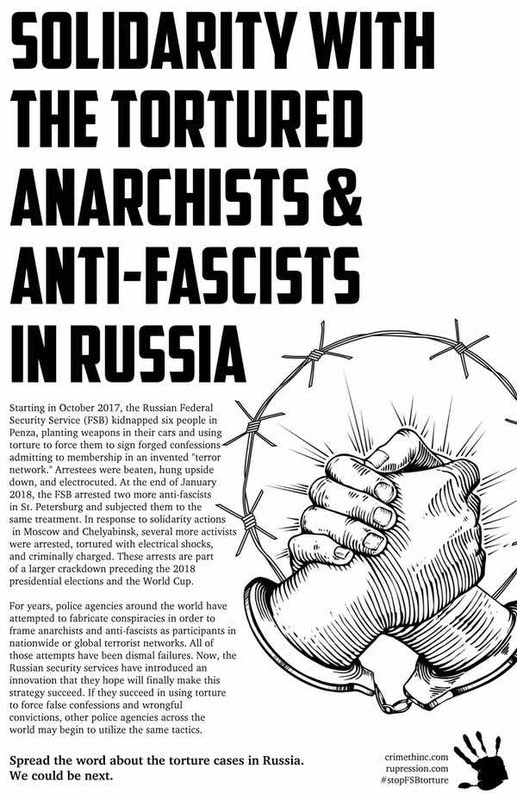 For the 18th of March, the day of solidarity with political prisoners, we wish to express our solidarity with imprisoned anarchists and antifascists in Russia. They have been targeted by the Russian political police FSB in the days leading up to today’s presidential election in Russia. While the political repression against revolutionaries has a decade-long tradition in Russia, the most recent attacks were against comrades in Chelyabinsk. As in previous cases, the comrades were beaten and tortured by the police. However, our comrades refuse to bow to the power of the state. They have declared that they will not cooperate with the state and instead focus their strength on propagating their political opinion and continuing their struggle. We believe that this is the only adequate response to repression – we will not retreat and give up, we must continue and acknowledge that an attack against us must mean that the state feels threatened by us. This entry was posted in General, Repression and tagged Russia on 2018/03/18 by Rote Hilfe Schweiz.